The area surrounding the station has experienced many changes over the years as can be seen from the shops in these photographs. 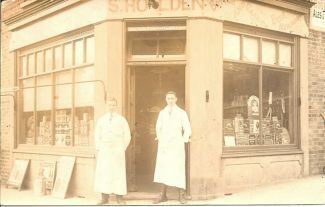 Originally in the early 1900’s there were two shops – one on either side of the road at the bottom of Station Road hill. The first picture shows that Holdens were a grocery store. The shop later became an off-licence as well as a general store still selling grocery products. On the other side of the road was a butchers shop with an abbattoir at the rear. Health officials would have a field day in modern times with the methods of displaying their goods on offer. The butchers shop is no longer there having been demolished with the passage of time and is now just a row of terraced properties.However the first properties painted white,although modernised,are still the original buildings. 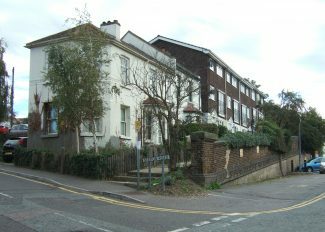 If anyone has comments or early memories of this area of Benfleet, please feel free to attach your recollections to this site. Aggie’s Grocery Stores and Off Licence, Station Road. Fond memories of Aggie, a rather forbidding Irishwoman, back in the ’70’s and ’80’s who would always oblige selling booze out of hours if our parties had gone rather too well, even if the price’s were exorbitant and the food well past it’s sell by. A delightful eccentric who blew smoke in the face of health and safety, a great character and much missed. 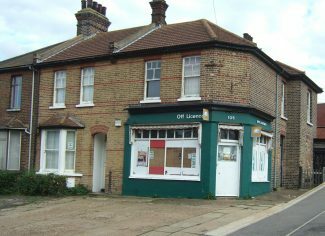 The grocery shop is now a estate agents. its weird to see what it used to look like. very interesting! I can certainly remember Aggie, if her daughter was behind the counter she would serve us bottles of Stingo, a very strong barley wine. If Aggie came out during these transactions, we’d get a clip round the ear if you couldn’t get to the door first! I remember once not getting to the door first and she said “so, you want to drink do you” and she took the top off the bottle and made me drink the lot. I was about 13 I think, but you didn’t argue with her. How times have changed, where are the characters now one wonders? 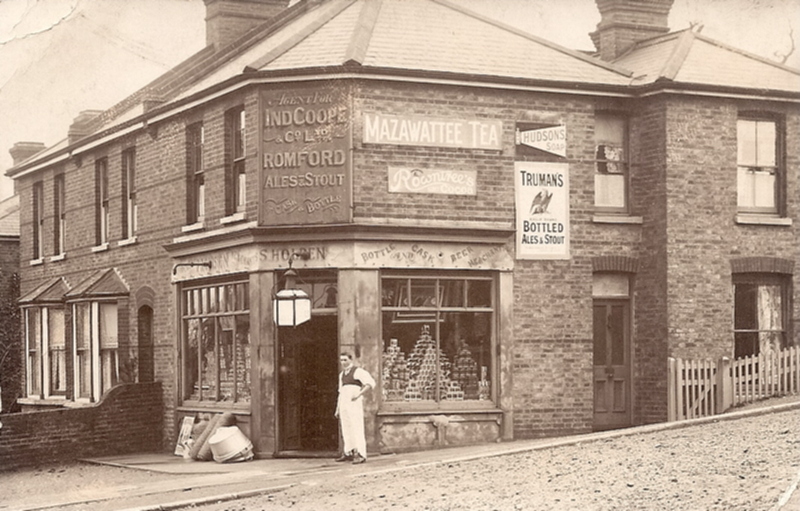 I too remember Aggie, as a small child growing up in Hall Farm Road, from 1965 to 1986, we’d go in there on our way out somewhere by train or sometimes (bravely) by myself if I was wandering around, as you could back in them days, till tea time. She scared the life out of me, you’d walk in the door and she’d go, “yes , can I help you, what do you want,” and if you dared dither a minute she’d shove some sweets in my hand and make me buy them. I was too scared to say no so I quickly learned to decide what I wanted before even going in. For sweet shops in general I preferred “Alfs newsagents” almost opposite St. Mary’s Church in the High Road and the post office was next door, or next door but one, I can’t remember what the in between shop was but, yes I remember dear old Aggie, was a tall, sturdy lady, very pale skin too . I too remember Aggie. Indeed she always seemed a giant of a lady. I first saw her when I was in the cubs and we would go in to get some sweets before starting our nature treks on the downs. Later when I was a bit older and in the scouts I got chatting to her. I remember her telling me that she had worked on the Irish Railways where she was a cook/chef. She told me how to boil potatoes quickly to produce mashed potato. To this day I still use the same method and this always reminds me of her. I was still visiting the shop when I was “grown-up” which was in the early 90’s, and Aggie was still there then, although a lot smaller than when I first visited. In all she must have run that shop for around 30 years or more. 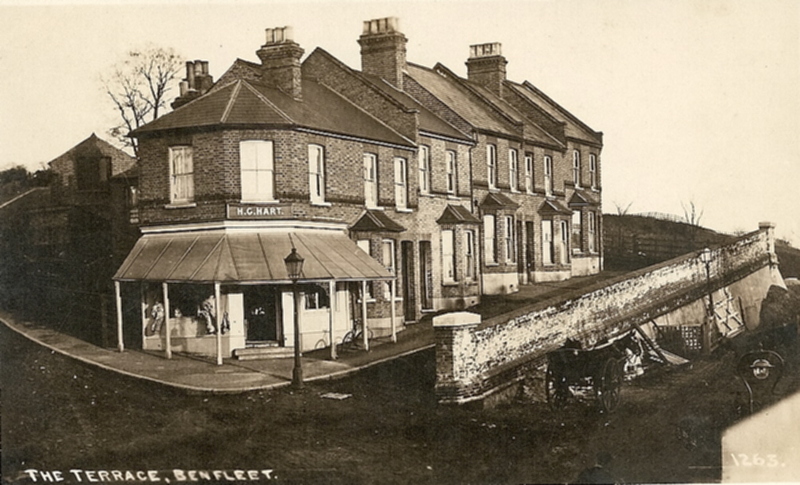 I was a taxi driver stationed at the Benfleet station rank in the early 70’s. 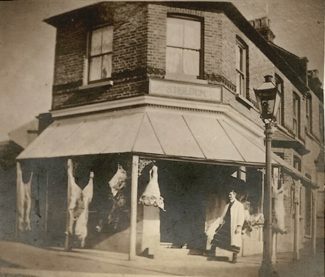 At that time, shop no.1 above was owned by an Irish family. Unfortunately I do not know their surname but the mothers name was Agnes (we called her Aggie) and she had two daughters named Una and Nula. Aggie always seemed to me to be a giant of a woman but when you knew her she was really lovely. At that time the shop was a general store selling groceries and provisions. 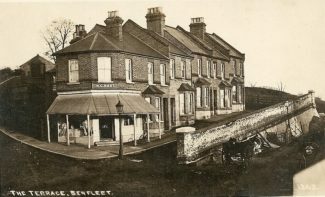 Benfleet Station, and the High Street in pictures.